A 7.3 magnitude earthquake struck 18 km southeast of Kodari in Nepal around 12.35 pm today. It comes only two weeks after a massive 7.9 magnitude earthquake claimed more than 8,000 lives and caused large-scale damage in the Himalayan nation. At least 66 people have been killed and more than 1,100 have been injured in Nepal. Many buildings have collapsed in a town called Chautara in Tuesday's quake, an official with the International Organization for Migration was quoted by the Associated Press as saying. Authorities say Dolakha, Sindhupalchowk, Kathmandu and Lalitpur were most affected. According to the Indian home ministry, the quake claimed 16 lives in Bihar and one in Uttar Pradesh. Thirty-nine people were also injured. Today’s earthquake occurred at a depth of between 15 and 18 km, according to the US Geological Survey. The epicentre is 76 km east-northeast of capital city Kathmandu. Media reports say people rushed out of buildings in Kathmandu when the tremors started. Tremors were also felt in many places in northern Indian states as well as in parts of Afghanistan, Pakistan and Southeast Asia. The US Geological Survey calls today's quake "the largest aftershock to date of the M 7.8 April 25, 2015 Nepal earthquake". But Indian experts disagree. “As it is of 7.3 magnitude as per the US Geological Survey, it cannot be termed as an aftershock,” says Supriyo Mitra, associate professor at Department of Earth Sciences, Indian Institute of Science Education and Research (IISER) Kolkata. 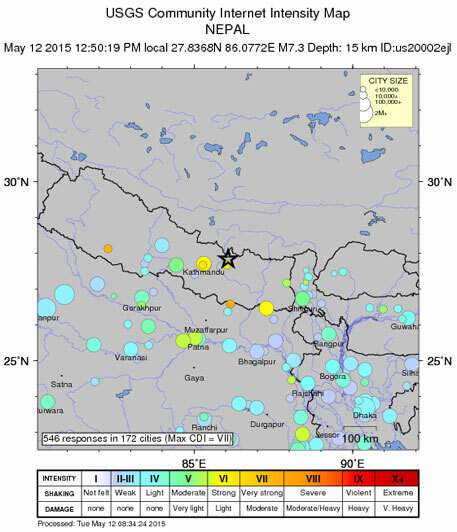 “This is a fresh earthquake, but is associated with the earthquake in Nepal in other ways,” he said. Mitra explains that aftershocks are generally at least one magnitude weaker than the main earthquake. Since the M 7.3 earthquake on Tuesday, at least seven tremors between 4.5 and 6.2 magnitude were recorded in the region around Kodari, according to the European-Mediterranean Seismological Centre. I quote- "The May 12, 2015 event is the largest aftershock to date of the M 7.8 April 25, 2015 Nepal earthquake Ã”Ã‡Ã´ known as the Gorkha earthquake - which was located 150 km to the west, and which ruptured much of the decollâ”œÂ®ment between these two earthquakes." Aftershocks can come for a long time. The Feb 25 2011 ChristChurch earthquake was part of the aftershock sequence of the Canterbury earthquake of September 2010. We have included both the US and Indian versions in an effort to understand today's event.